With Deal or No Deal no longer in production Seven had been exploring the idea of a local version of UK quiz show The Chase, but has since dropped the idea. 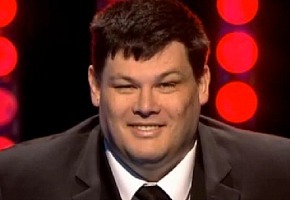 A call went out recently for Australians based in London to appear on an Aussie version of the show which sees contestants go up against their very daunting brains trust, Mark Labbett. Presumably a local version of the ITV show filmed in London would have retained the show’s best UK elements, with Aussies chasing the big money. But a Seven spokesperson told TV Tonight, despite some exploration, the show is no longer on the cards. Meanwhile UK episodes screen weekdays at 3pm. You’ll be happy to know that Seven is going to make its own episodes of ‘The Chase’ beginning this month. When they will air, I don’t know, but I know one of the British chasers is heading to Melbourne and will join three Aussie chasers. Absolutely we should do Numberwang. Such a shame. It’s a great show and I was hoping we’d get a local version. Bugger Channel 7 doing a version of this. Why doesn’t Channel 10 do it, nothing to lose, and if it rates, it can really stick it up Channel 7 butts. I love The Chase. I don’t think an Aussie version would be as good as the English because in my opinion the jokes and onliners between the host, the Chasers and the contestants really make the show what it is. There are actually four chasers, used to be three in the earlier episodes but now four! An Australian would have been great, but am happy to see out the UK version. Their version is great. What about an Aussie version of Numberwang? I’d watch that. IIRC an American network did the same thing – had a couple of test episodes produced by ITV then decided against actually doing a fully fledged local version. And Mark isn’t the only chaser! It’s a great show if anybody is home at 3 o’clock in the afternoon! I think I am the not only one here who will say: I want a Chase Australia. If there is an Australian chase I hope it’s with Anne (the robust female chaser) as the chaser. Her deadpan humour is the bust. That’s a shame. I recently got into this show and thought a local version would of been good. I noticed that The Chase is now in repeats. I watched The Chase and another UK game show, Pointless while I was in London and was hooked on both formats, though I give the edge to The Chase. Definitely check some of the stuff on YouTube, in particular some of the host, Bradley Walsh’s funny moments. Seven should reconsider their decision. Would love to see an Aussie version of The Chase! I think that’s a real shame, the UK version is great. It would be good if Seven would play new episodes or the US version instead of repeats as they are currently. Pity about that, this is a really great quiz show, would have to say in my opinion one of the best shows around at the moment. if Seven wants to produce a British game show, they should do a local version of the BBC’s Pointless. absolute gem of a show.